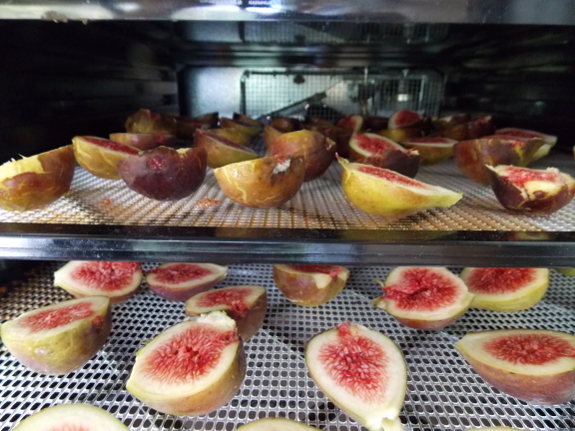 Last year, I had a love affair with roasting figs. 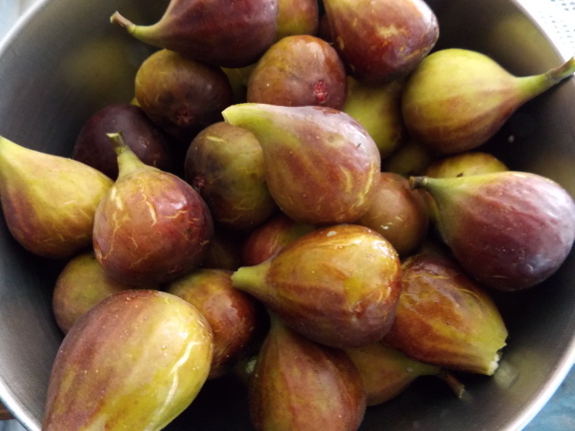 This year, I'm not as keen, probably because the figs are bigger, moister, and don't roast quite the same way when halved. Instead, I'm returning to my first love --- dried figs. Our Chicago Hardy tree has been in the ground just shy of 3 years, and it's already starting to produce masses of figs. For the past week, I've been able to pick a bowlful every other day, and the bowls keep getting bigger. Sunday's bowl contained about a gallon of figs. Although it's a bit wasteful of energy, I dry the figs right away rather than saving them up in the fridge the way my father does until he has a full dehydrator load. I wait to pick the figs until they're so ripe the skins have cracked, and I don't want to risk any spoiling. So I halved each fruit in my bowl and filled two trays of the dehydrator, then sat back and waited for the rich rounds to come out that afternoon. 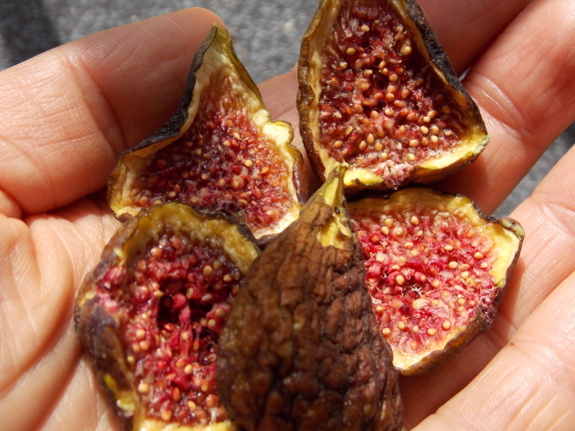 Next year, I'll save some of the dried figs for the winter. This year, I'm just enjoying eating them up, in between bowls of raspberries and crisp Virginia Beauty apples. Our chicken waterer keeps the flock healthy with unlimited clean water. Those look so good! Have you tried drying some whole, without cutting them? Eric --- I haven't, because I figure it would take at least twice as long to dry. But possibly they would be even tastier whole--- probably worth a try!